For the month of October, Breast Cancer Awareness Month, five of Bandai Namco's Ms. Pac-Man titles will directly support funding for early detection services of breast cancer. Bandai Namco will support the National Breast Cancer Foundation for all of October through the Ms. Pac-Man Pink Ribbon Campaign. The proceeds from the purchases of a Pink Ribbon-themed maze in five select iOS and Android titles will be donated to the National Breast Cancer Foundation to aid in early detection, education, and support services. The three iOS titles include PAC-MAN/Ms. PAC-MAN, PAC-MAN Lite/Ms. PAC-MAN Lite, and Ms. PAC-MAN for iPad/Ms. PAC-MAN for iPad Lite. The two Android titles include Ms. PAC-MAN and PAC-MAN + Tournaments. Namco Bandai will sell the maze of each title for $0.99 through October, and all proceeds go directly to the NBCF. 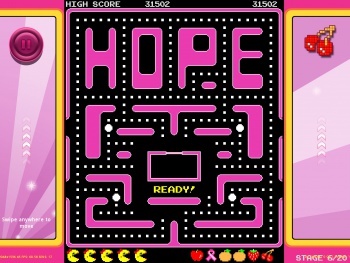 The Pink Ribbon-themed maze spells out "HOPE," and the artwork is different as well. The NBCF's mission is to help women by raising awareness of the disease as well as raising awareness of early detection services. The NBCF provides free mammograms to women in the U.S. to catch a diagnosis in the early stages. "We are very excited about our new partnership with Bandai Namco and the Ms. PAC-MAN Pink Ribbon Campaign," NBCF founder and CEO Janelle Hail said in a prepared statement. "By encouraging their gamers to Join the Pac, we can reach more women than ever with our message of hope. The funds they raise will allow us to provide early detection services for women in need in all 50 states." The American Cancer Society estimates one in eight women will be diagnosed with breast cancer. Breast cancer is the second leading cause of cancer death in women.